From early spring through late fall, native bees move from plant to plant, searching for protein-rich pollen or high-energy nectar. But sadly, our wild, native bees are disappearing as more of their natural habitat is lost to row crops or development, die-off from diseases and pesticides continues and the impacts of climate change take an ever increasing toll. Native plants are essential for native bees because unlike many ornamental and nonnative plants, they reliably produce the nectar and pollen on which bees depend. Baby blue eyes (Nemophila menziesii) stunning sky blue flowers bloom in California from late winter through early summer – and provide a great food source for mason bees. Native to AK , CA , NV , OR. False sunflowers (Heliopsis helianthoides) will grow in less-than-ideal soils and tough summer heat to keep native bees going from June through to early fall. Native to AL , AR , CO , CT , DC , DE , FL , GA , IA , IL , IN , KS , KY , LA , MA , MD , ME , MI , MN , MO , MS , NC , ND , NE , NH , NJ , NM , NY, OH , OK , PA , RI , SC , SD , TN , TX , VA , VT , WA , WI , WV . Add fragrant anise hyssop (Agastache foeniculum) to your garden, and it will hum with bumble bees, masked and digger bees seeking pollen and nectar from the soft, violet-blue flower spikes. Native to CO , CT , DE , IA , IL , KY , MI , MN , MT , ND , NE , NH , NY , PA , SD , WA , WI , WY. The leaves of native rose bushes, including swamp rose (Rosa palustris), are used by leafcutter bees, while bumble bees visit the flowers for nectar. Native to AL , AR , CT , DC , DE , FL , GA , IA , IL , IN , KY , MA , MD , ME , MI , MO , MS , NC , NH , NJ , NY , OH , PA , RI , SC , TN , VA , VT ,WI , WV. Native trees for bees? The beautiful black willow (Salix nigra) produces many-flowered “catkins” in spring that provide pollen for ground-nesting native bees. Native to AL , AR , CT , DC , DE , FL , GA , IA , IL , IN , KS , KY , LA , MA , MD , ME , MI , MN , MO , MS , NC , NE , NH , NJ , NY , OH , OK , PA ,RI , SC , TN , TX , VA , VT , WI , WV. The blue pollen in large-flowered collomia (Collomia grandiforma) provides food and turns the pollen sacs on the legs of bees a bright blue as they forage on the flowers. Native to AZ , CA , CO , ID , MT , NV , OR , UT , WA , WY. Hollow canes/prunings from native berry bushes like the Allegheny blackberry (Rubus allegheniensis) make excellent nest sites for cavity-nesting bees, while their spring flowers are visited by many types of native bees. Native to AL , AR , CA , CT , DC , GA , IA , IL , IN , KS , KY , MA , MD , ME , MI , MN , MO , NC , NE , NH , NJ , NY , OH , OK , PA , RI , SC , TN ,VA , VT , WI , WV. Much appreciation to the gardeners in Hawaii who are growing native plants like the ʻŌhiʻa lehua (Metrosideros polymorpha) to help save endangered Hawaiian yellow-faced bees. If you have a soggy spot or are planning a rain garden, put in a buttonbush (Cephalanthus occidentalis)! 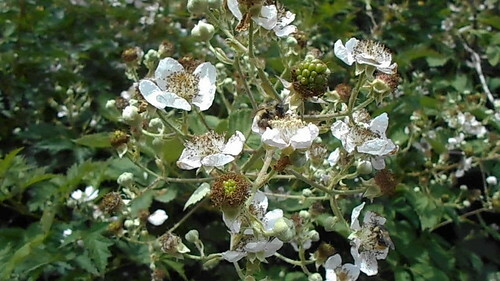 The round, white flowers are preferred by many long-tongued bees. Native to AL , AR , AZ , CA , CT , DC , DE , FL , GA , IA , IL , IN , KS , KY , LA , MA , MD , ME , MI , MN , MO , MS , NC , NE , NH , NJ , NY , OH ,OK , PA , RI , SC , TN , TX , VA , VT , WI , WV. Bee balm (Monarda didyma) has clusters of long-tubed flowers in summer that are irresistible to bumble bees of all sizes. Native to CT , GA , IA , IL , IN , KY , MA , MD , ME , MI , MN , MO , NC , NH , NJ , NY , OH , OR , PA , SC , TN , VA , VT , WA , WI , WV. Come fall, after summer flowers have faded, masses of small white heath aster (Symphyotrichum ericoides) blooms serve up nectar for both short and long-tongued bees. Native to AR , AZ , CO , CT , DE , IA , ID , IL , IN , KS , MA , MD , ME , MI , MN , MO , MS , MT , ND , NE , NH , NJ , NM, NY , OH , OK , OR ,PA , RI , SD , TN , TX , UT , VA , VT , WA , WI , WV , WY. 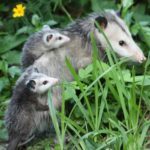 Take action for bees and other wildlife in peril! Along with adding native plants that benefit wild bees to your garden or landscape, join us in calling on members of Congress to do their part for bees and all vulnerable wildlife by supporting the Recovering America’s Wildlife Act.